Central banks buying stocks are effectively nationalizing US corporations just to maintain the illusion that their “recovery” plan is working because they have become the banks that are too big to fail. At first, their novel entry into the stock market was only intended to rescue imperiled corporations, such as General Motors during the first plunge into the Great Recession, but recently their efforts have shifted to propping up the entire stock market via major purchases of the most healthy companies on the market. The chaos and dysfunction message is loud, but markets aren’t hearing it. The real story is very different. Stocks continue to surge; stock market volatility continues to sit at ten–year (pre–crisis) lows. The interest rate market is much higher than it was before the election, but now quiet and stable. Gold, the fear–of–the–unknown trade, is relatively quiet. This all looks very much like a world that believes a real economic expansion is underway, and that a long–term sustainable global economic recovery has supplanted the shaky post-crisis (central bank–driven) recovery that was teetering back toward recession. In other words, political chaos in the regime is not denting the stock market, because central banks buying stocks are eliminating volatility. Indeed, if you were to gauge the economy at this point by the US stock market, everything must be grand because the Trump Rally has been one of our most exuberant stock rallies. Remember, the financial media and Wall Street are easily distractible. Not only do they have short attention spans, but they’ve been trained throughout their careers to find new stories to obsess about…. We have major central banks around the world that continue to print money. These central banks buy assets with that freshly printed money. That means, stocks, bonds and commodities go higher. Distract you from what? Distract you via the roaring success of stocks from the fact that the central banks’ recovery is failing everywhere. As Rich says, the fate of the world now rests on the successful outcome of these new policies because the banks that are now too big to fail are the central banks, themselves. The Fed and its central proxies are creating a grand distraction from a story that would chill America to the bone … if the truth were told. The Federal Reserve already confessed it rigged the stock market last January in hopes of creating a “wealth effect” throughout the US economy. Its plan, confessed by ex-Fed governor Richard Fisher was to front-run the stock market with its forward messaging about bond purchases though which it created massive liquidity that would be invested in stocks. Until now I have been speculating about central banks buying stocks, claiming that was all that was supporting the stock market; but I was also just speculating for years that the Federal Reserve was intentionally front-running the stock market throughout its “recovery.” Now those interventions in the stock market, which fueled the Fed’s recovery throughout the market’s long climb, are a well-known fact, admitted to by the Federal Reserve. My speculation that the long bull market was driven almost entirely by banks was much doubted years ago when I and other writers gathered at Zero Hedge, were claiming that was exactly what the Fed was doing. I couldn’t prove it back then, but everything clearly pointed in that direction, even as many experts denied it. Last year, I upped my claims to saying that I believed the only thing that terminated the stock crash in January was a move toward even more direct Fed rigging of stock prices via having proxies buy oil (one significant cause of the January crash) and stocks directly. All year long, I speculated that the Fed was merely holding the illusion of recovery together by directly buying select commodities and stocks to drive the markets back up because it was an election year in which they would “pull out all the stops,” In this case that expression doesn’t mean organ stops, but all the market stops, but particularly the biggest stop of all that said central banks should not buy stocks because their capacity to rig the markets is infinite, and they have no investment risk. They can buy and hold forever, and they can create new money to replace any they lose. As if to confirm my suspicions, the Fed began talking early last year about the possibility of buying stocks directly. However, they implied that would only happen, if at all, in some distant future should the economy crash again. I stated that this thing they would like to be able to do overtly and with everyone’s blessing was something they were already doing covertly. They were merely running the flag up the pole to see if they could move from working through proxies to being able to work openly — testing the nation’s response by putting the idea out there. Recently Bank of America, the Wall Street Journal and others have begun to state that central banks are buying stocks in huge quantities. The only questions remaining is whether they are doing so at the Fed’s bidding and whether they are doing it primarily to prop up an otherwise failing stock market. What is the scale of central banks buying stocks? Among the reports on portfolio holdings yesterday, we heard from the Swiss National Bank…. Switzerland’s central bank has more freshly printed money to put to work every quarter, and has been increasing their allocation to equities dramatically–$80 billion of which is now (as of the end of the first quarter) in U.S. stocks! That’s a 29% bigger stake than they had at the end of 2016. The SNB is the world’s eighth biggest public investor. In one quarter, they upped their stake in US stocks by almost a third, and they are only the eighth-largest public investor! What are the other big guys doing? Indeed, that one fact by itself may sum up everything there is to say about why stocks are still rising and why the Trump Rally was as steep as it was and why it is trying for a third time to push a hole through the ceiling. Market watch notes that central banks have gobbled up a “record amount of financial assets” this year. At the time the research was conducted, this would translate into well over $3 trillion annualized, making this the strongest period of central-bank stimulus since 2007! No small claim, since that earlier period was the most extraordinary stimulus burst history had ever seen. The newly created money invested by the Swiss National Bank didn’t attempt to buy important but dying companies. It went predominantly to Facebook, Alphabet (Google) and Apple. Is it any wonder, then, that these stocks, known as the FAANG stocks, are the ones that drove the NASDAQ to new heights? Switzerland’s central bank now owns more publicly-traded shares in Facebook than Mark Zuckerberg, part of a mushrooming stock portfolio that is likely to grow yet further. The tech giant’s founder and CEO has other ways to control his company: Zuckerberg holds most of his stake in a different class of stock. Nevertheless this example illustrates how the Swiss National Bank has become a multi-billion-dollar equity investor due to its campaign to hold down the Swiss franc. In 2017, it stepped up its purchases! BofA’s analysts called this “supernova of liquidity” the “only one flow that matters” and the “best explanation” for the double-digit gains in stocks that was happing in the first half of the year. They called it the “the $1 trillion flow that conquers all.” So, now we have moved from my speculating all of last year that central banks buying stocks were the sole factor that was pushing up stocks to Bank of America now proclaiming outright that it is the sole factor that matters in the rise of US stocks — a factor so huge that it dwarfs all other drivers. Besides selling commodities and derivatives that central banks might naturally want to trade in (such as gold by which they manipulate the price of gold in order to secure their proprietary product — money), the CME sells futures on US stocks. The algorithms used by the bots that now do 80% of the driving in the US stock market peer into futures like a fortune teller looking into her crystal ball. So, the CME offers a lot of leverage for moving stock prices by steering the bots. The largest investors the CME markets its operations to are central banks. The CME has a program specifically designed to entice central banks and to facilitate their purchases through discounted fees. That program doesn’t even try to hide its purpose as it is called the “Central Bank Incentive Program.” Incentive programs are reserved for the CMEs highest volume traders. A non-US central bank, multilateral development bank, multilateral financial institution … or an international organization of central banks. [Said institutions must] execute all trades in the Qualified Participants name. After all, you wouldn’t want a proxy using the name of the ultimate money source if that were the Fed or if it were acting on behalf of the Fed. You wouldn’t want the Fed’s name in any way associated with the trade. Did the Fed move its markets group to the same place as the CME in order to develop proxy trading relationships with all of the central banks in the world that use the CME for trading in oil and stock futures? Strangely, not a single central bank on earth shows any CME products on its balance sheet; but surely the CME does not have this dedicated program for the sake of serving no one. Since CME incentive programs are reserved for the CME’s highest-volume traders (basically offering a bulk discount), central banks must be purchasing CME products and not disclosing so on their balance sheets. Why the apparent secrecy on the part of central banks as to their participation? CME Group clearing firm or FCM (Futures Commission Merchant) for their proprietary trades and/or trades done on their behalf by an asset manager. I wonder if people working in the Federal Reserves “markets group” engaged in “account services to foreign central banks” could serve as asset managers for a central bank with an account at the CME.” Just wondering. In which case, might they not help manage those central banks’ purchases in a manner that serves the aims of the Federal Reserve? Just a thought. Maybe the Fed is just nearby to counsel them or urge them or provide incentives to make certain stock trades at certain times. Maybe the Fed’s move to the place where central banks of the world trade at a time when central banks buying stocks in the US has become a new phenomenon is all one big coincidence. Regardless, central banks are clearly engaged in massive US stock trades. You don’t get those bulk fee discounts any other way. The satellite office in the Midwest readies the New York Fed for perhaps the most delicate U.S. interest-rate hike ever. With rates having been near zero for more than six years, and markets flooded with reserves, the Fed will rely on an array of new tools to help it tighten policy, likely later this year. MAYBE the move had less to do with fear created by Hurricane Sandy than it had to do with establishing the new tools that would help the New York Fed achieve intervention readiness for managing its first interest-rate increase without crashing stocks. I suppose one way to safely avoid a market crash when making your much-feared first interest-rate increase would be to get other central banks to jump in with rescue stock purchases if the stock market dared to respond negatively. Remember how the market leaped upward for a few days after the first increase? Was that the central banks jumping in before their new machine was fully calibrated or maybe giving a more-than-necessary boost just to err’ on the safe side? Interfaces with market participants to obtain context for asset price movements…. Relates developments in financial markets to issues pertaining to financial stability.… Plans and executes transactions in foreign exchange or fixed income markets on behalf of the U.S. monetary authorities, foreign central banks, and other customers. Would those “market participants” be the central banks that are the “Qualified Participants” in the CME’s incentive program, and would the “asset price movements” be intentionally targeted asset price movements, and not just observations of natural market movements? The precarious part of this equation is what it shows of the Law of Diminishing returns that I keep harping about as an economic fundamental that cannot be averted even by central banks. The further we have gone into the “recovery,” the greater the amount of global stimulus that has been needed to keep the recovery afloat and the more direct and broad the intervention has had to become. There is no global reduction of stimulus so far. The only thing that has shifted is where the stimulus is coming from. I have always stated that the recovery program is completely unsustainable and that all signs of life end as soon as the artificial life support is removed. The patient has been dead since 2008. We have gone from the Fed and/or US Treasury buying stocks to save a few key companies (an innovation at the time that was worrisome to many) to numerous central banks buying up large swaths of the market. The stock intervention has become greater, not smaller, because of the Law of Diminishing returns. You have to ask yourself, as I did about Carmageddon, “What is the end game here?” What happens when central banks need to unwind from these positions and, so, start to flood the market with these stocks. I think the answer is they can no more do that than they can bring their recovery to a successful conclusion (hence the continued massive stimulus a decade after it all began, even as they talk of unwinding). It is absurd that anyone thinks the Fed is unwinding successfully when everyone else has been maintaining or increasing stimulus and when much of that flows to the US. To see where this all goes, we have only to look at Japan where, again, the Law of Diminishing Returns erodes endlessly at their goals. Japan entered the game of rigging its stock market back in the 1990s, and it is still as desperately stuck in this liquidity trap as ever. There is no end game. A recent poll of currency reserve managers at reserve banks showed that 80% of the 18 central banks polled plan to increase their investment in stocks. That was almost double the number of those interested in buying corporate bonds. The hope of central banks is to create a self-sustaining illusion, wherein people will see a market that appears healthy and growing and then jump in and take off where the central bank leaves off. As we can see from Japan, the results are not that positive, and the illusion certainly has never become self-sustaining. It is more of delusion. No central bank has navigated its way out of this so far. China, for having done the same thing, is probably worse off than Japan, truth be known beyond the always-deceptive cover of its double bookkeeping system. You see, at the end of the day, this is not just stock manipulation; it is CYA time. The Fed’s recovery is a failure because it was never sustainable from its onset. It was a bankrupt idea. For the recovery to be called a success, GDP would have to have improved, and it has done nothing but doggedly follow a downward path for years. CLEARLY NOT A RECOVERY! GDP growth well that is now under 2% can hardly be called “recovery.” The end game was supposed to be that a thriving economy would be able to absorb the Fed’s very gradual unwinding, but that vital economy never emerged. The central banks have painted themselves into a corner. By their own designs, they get no interest off all the bonds they hold. They cannot sell them without substantially raising the interest on the national debts of the nations they are obligated by charter to serve. (The ECB now owns 40% of Europe’s national debts.) So, they buy stocks to maintain the illusion of recovery and to have someplace to put the money they keep on their balance sheets. Then they cannot sell those without crashing their own stock markets. So, the game continues to spiral upward in terms of the aggregate of CB investments … as seen in Japan and in China and now the US. Some call it the liquidity trap. Twenty years ago central banks didn’t even think of buying stocks. It may have happened in odd instances, but it was an anomaly if it did as a way to save a specific bank or credit union. During our first plunge into the Great Recession, the Federal Reserve and the US Treasury bought up large amounts of stock in order to save companies that were either vital to US employment or to financial markets that were dying from their own mistakes. Those were efforts to save specific key corporations. In subsequent years, the Bank of Japan and the Peoples Bank of China soaked up stocks in massive amounts more or less across the board, not to save specific vital companies but to save their stock markets. The Chinese seized total central control of their market, even mandating that certain speculators stay out of the market, mandating that various proxies buy large volumes of stocks and locking the stocks that were falling worst out of trading. As a result, they created a perfectly healthy and real stock market, right? No, they created a centrally controlled illusion that is not a free market at all; it is merely a fatalistically predetermined game in which the government has decided “the market,” a term that now requires air quotes, will do well. To achieve that end, the government or its central bank does whatever it needs to in order to keep stocks up. We all know China’s market became completely rigged. We are just now seeing in the mainstream media that the US stock market is also increasingly rigged by central banks buying stocks. What about the official reason banks give for central banks buying stocks? Since central banks are the first to claim they are not about making profits, that is a completely illegitimate reason for buying stocks; but that’s the CYA reason banksters give: According to Bank of America Merrill Lynch, nearly $11 trillion in global assets yielded negative interest last year. Thus, central banks are forced to reach for yield in riskier assets like everyone else. Really? That was all their doing. Central banks created that situation intentionally, and the Federal Reserve has been saying it wants to unwind its balance sheet. If so, why does it want to make bigger profits on the money it supposedly wants to unwind? It’s a completely self-contradictory argument. Yet, the experts are readily buying into it. If you buy their argument, then you have to admit that central-bank policies are hurting the central banks just like they are hurting retirees and everyone else who needs yield in order to survive But why does the bank, which has the power to print money at will, care about earning it the hard way? No, I think it is really entirely about propping up their own stock markets. We know that is why Japan and China have been doing it. Why would the US be any different, even if the Fed hides behind proxies? In the National Bank of Switzerland’s case, a different reason altogether is presented, which has some truth to it: The Swiss franc is hugely popular when times are bad. When everyone wants to buy francs, the value of the franc is driven up relative to other currencies, which makes it hard for Swiss companies to compete for international trade. To offset this, the Swiss National Bank tries to buy up other currencies. They have to put the foreign money somewhere, so they are investing it in top US companies. In proportion to the size of its national economy, the Swiss National Bank’s balance sheet is the most bloated of any major central bank … and still growing with no end in sight. A convenient alignment of Fed interests with francish interests. With central banks having the capacity to create money by decree anytime they want to, investment risk means little to nothing. Lose your money, it ceases to exist. In that case, just crete more of it. With their ability to create unlimited amounts at zero cost (just add some ones and zeros to an account somewhere), their capacity to move markets they choose to invest in is almost unlimited. Essentially, the only limit on how much they can do is inflation, which throughout the Great Recession has never posed as a limiting factor. For those few who are still unfamiliar, this is how central banks who create fiat money out of thin air and for whom “acquisition cost” is a meaningless term, are increasingly nationalizing the equity capital markets. As the WSJ puts it “these central banks care relatively little about whether such investments make profits or losses—though they can matter politically—because they can always print more of their currency. So risk is less important, analysts say.” And since risk was no longer part of the equation, leaving only return, central banks started buying stocks…. So between central banks outbidding each other to buy “risky” assets with “money” that is constantly created at no cost, very soon all other private investors will be crowded out but not before every stock is trading at valuations that even CNBC guests won’t be able to justify…. The bad news, is that as more people realize that a free “market” now only exists in textbooks, and that Soviet-style central planning is the only game in town, confident in price formation will evaporate, in turn pushing even more market participants out of the quote-unquote market, until only central banks are left bidding on each other’s otherwise worthless stock certificates. At the same time, efforts to invest reserve funds more broadly mean that more markets will be subject to what some critics describe as central-bank distortion, as large and often price-insensitive buyers run the risk of driving up prices and reducing prospective returns for other market participants. For virtually all central banks, however, the grotesque central planning shift of the past decade means that instead of engaging in monetary policy, the world’s central banks are now activist hedge funds, who are focused first and foremost on “investment management.” … and at the current rate of expansion, within a few years the world’s monetary authorities who are tasked with “financial stability”, will have acquired a majority of the world’s equity tranche, effectively nationalizing it. Even the Wall Street Journal denies the argument that central banks have to care at all about making a profit. As Russia became more of a free-market economy, the United States has started to look more like the centrally-planned economy of the former Soviet Union. Markets have been centrally manipulated beyond the repair. 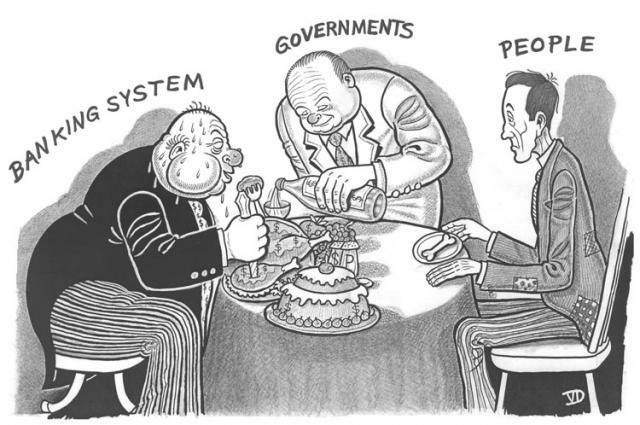 Central banks buying stocks applaud their own recovery effortsAs always, the central planners have the arrogance of the elite that causes them to think they have the brilliance to guide and control the markets of entire nations and even the entire world. How can anyone believe that such hubris will not end in total financial collapse?